God could soon be making an appearance in every public school in Florida. The bill was approved in a 97-10 vote after Democrat Rep. Kimberly Daniels sponsored it. Daniels pointed to the recent shooting at Marjory Stoneman as evidence of the need for more God. The bill would take effect July 1, 2018. It’s also not clear yet if the bill will also clear the Senate and be signed into law. With little surprise, the proposal is being met with resistance from atheists and others who determinedly advocate for the separation of church and state. 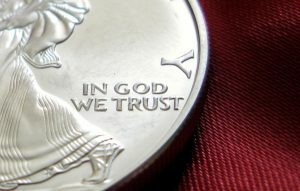 Florida House Rep. Carlos G. Smith disagreed with Daniels, saying that he believes the “In God We Trust” proposal be inappropriate. Passage of this bill came one day after lawmakers in the Hose did not pass a motion advancing a bill to ban assault rifles. Student survivors of last week’s attack have said that they want more than “thoughts and prayers” and are turning their frustration and anger into activism. Around 100 traveled to the state Capitol to amplify their calls for gun control. They are also planning a mass rally March 24 in Washington, D.C., to demand an end to gun violence and school shootings. What are your thoughts? Should ‘In God we trust’ be a clear message in all schools? Do you think God is missing in our public schools today?